From the Betty Boop collection by Plasticolor. 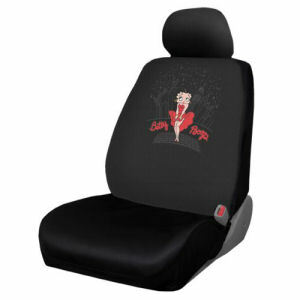 Betty Boop Skyline Low Back Seat Cover. From the Betty Boop collection by Plasticolor. Betty Boop Skyline Low Back Seat Cover. Made from 100% polyester with a urethane foam backing. Designed to fit most low-backed bucket seats and comes with elastic straps and hooks for a snug and secure fit. Machine washable. Plasticolor Betty Boop Automotive shipping from Canada. No Surprise Border fees or Customs!